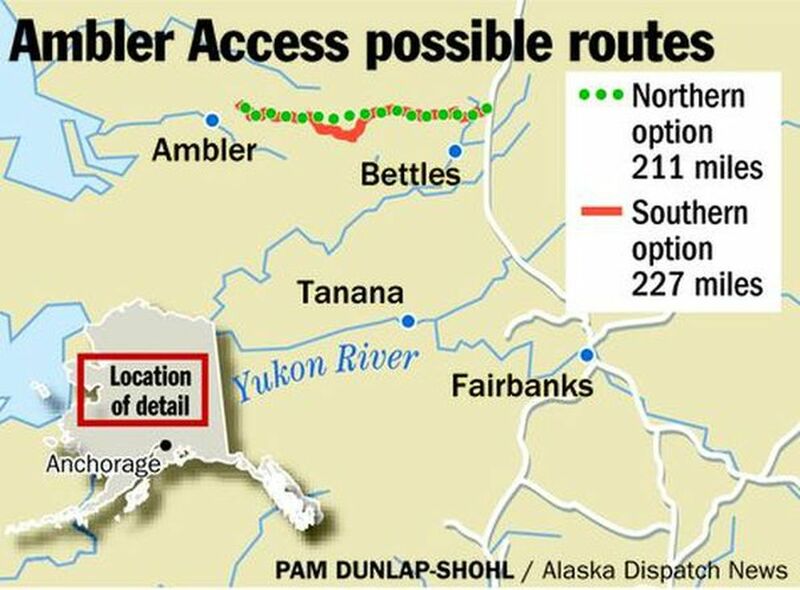 Alaska's remaining unaffordable megaproject, a problematic road into the heart of the Ambler Mining District in the Interior, is looming over the state's fiscal abyss. Despite the strongly supported and sound fiscal decisions to kill several other megaprojects — the Juneau Access road, the Knik Arm bridge and the Susitna-Watana dam — Gov. Bill Walker plans to move forward with a costly environmental impact statement for this 200-plus-mile road projected by its promoters to cost at least $430 million. That price doesn't include the road's pricey $8 million to $10 million in annual operating and maintenance expenses, or the millions of dollars required for environmental reviews and permitting. Don't be fooled by project supporters within the Alaska Industrial Development and Export Authority who claim that the state will be repaid by mining companies for those expenditures. There is no written agreement showing that will be the case. Mining company Trilogy Metals (formerly NovaCopper), the primary beneficiary of the Ambler road, has agreed to pay only $9.7 million annually for using the road over a 12-year period. In other words, the company is willing to pitch in just $116.4 million for a project that costs hundreds of millions more. As the Legislature convenes in Juneau this month, Alaskans should ask their representatives why the state is continuing to fund a project that greatly subsidizes the mining industry, which pays very little in state taxes even as we're draining our budget reserves and struggling to fund the operation of state government. To date, the state has spent more than $22 million on this proposed road. Notably, the mining industry beneficiaries at the end of the road could walk away from the project tomorrow. Despite opposition from villages in the region, the governor authorized AIDEA to spend $3.6 million to initiate the road's EIS process scheduled to begin this spring. By the time it's done, the EIS is expected to cost another $4.2 million to $6.8 million. This process will involve meetings with communities and tribes that have already strongly voiced their opposition to the road (see http://www.brooksrange.org/). The EIS also triggers a separate process with the National Park Service to obtain a right of way across Gates of the Arctic National Park, one of our state's treasured natural areas. Local communities are worried about degradation of subsistence resources if the road is built, including moose and fish, as well as caribou whose migration might be altered by the long east-west road. Increased pressure on game from non-local hunters is also a concern. A time of severe budget crisis is not a time to spend on problematic megaprojects. If there were truly a strong business argument to be made for this road, why hasn't Trilogy Metals shown more willingness to invest in it? Alaska's lawmakers should carefully analyze AIDEA's claims of revenue benefits associated with building the Ambler road, and ruthlessly scrutinize the costs of this proposal. Holding an oversight hearing with invited witnesses including AIDEA, Trilogy, representatives of nearby villages, and road cost and financial experts would be a good place to start. Lois Epstein is an Alaska-licensed engineer and the Arctic Program director for The Wilderness Society in Anchorage. She is a former director of the nonprofit Alaska Transportation Priorities Project, a statewide transportation watchdog organization. Lois N. Epstein, P.E., is director of The Wilderness Society's arctic program.